From left, nutritional sciences graduate student Joseph Beals, kinesiology and community health professor Nicholas Burd, kinesiology graduate student Sarah Skinner and their colleagues found that eating whole eggs after resistance exercise boosted muscle building and repair significantly more than eating egg whites with an equivalent amount of protein. 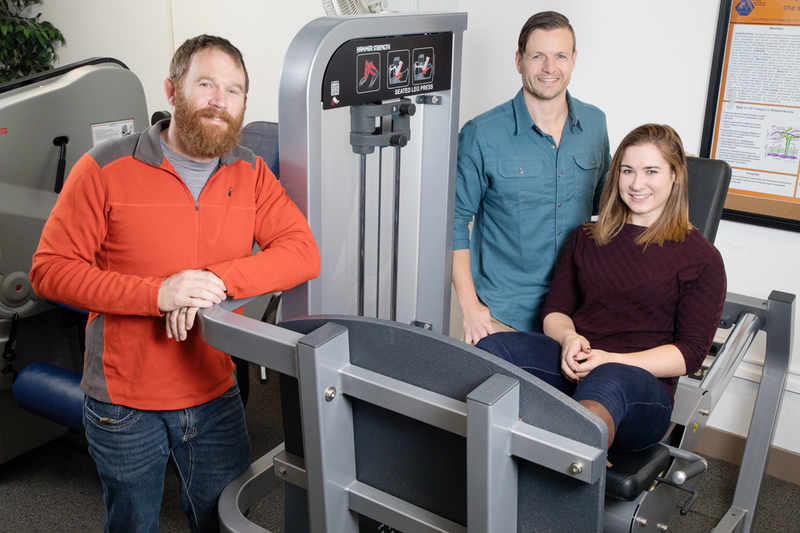 CHAMPAIGN, Ill. — People who consume 18 grams of protein from whole eggs or from egg whites after engaging in resistance exercise differ dramatically in how their muscles build protein, a process called protein synthesis, during the post-workout period, researchers report in a new study. Specifically, the post-workout muscle-building response in those eating whole eggs is 40 percent greater than in those consuming an equivalent amount of protein from egg whites, the team found. To reach Nicholas Burd, call 217-333-2461; email naburd@illinois.edu. The paper “Consumption of whole eggs promotes greater stimulation of postexercise muscle protein synthesis than consumption of isonitrogenous amounts of egg whites in young men” is available online and from the U. of I. News Bureau.